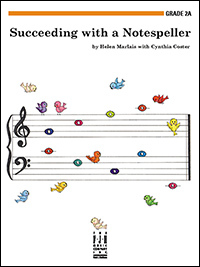 Succeeding with a Notespeller provides a terrific way to reinforce all the notes and intervals (Bass C–Treble G, steps and skips) presented in Succeeding at the Piano®, Preparatory Level. Students are motivated by colorful activities that are cheerful and fun! Can be a useful supplement to any piano method. 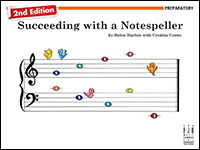 Imaginative and motivational note-reading and writing activities provide an educational and fun way for students to reinforce note reading at the very beginning levels of piano study. Slowly paced and logical, students can easily learn each new note on the staff with confidence. Students learn how to read in an ideal way by combining a traditional note reading approach with an intervallic approach. This is the surest way to quickly succeed with music reading right from the very beginning! Succeeding with a Notespeller provides an enjoyable reinforcement of the note names and intervals presented Succeeding at the Piano®, Grade 2A, but it also can be used with any method. Colorful and creative activities such as: fill in the blank; make that match; and complete the intervals make learning fun! Goals are varied and short - it doesn't take long to complete a page so students are motivated to finish assignments. Includes drills on notes, intervals, major/minor pentascales and chords in the keys of C, G, F, D,and A. This artistic book with brilliant colors and clever activities is so attractive that children can’t wait to turn the pages to see what comes next! Note reading is reinforced with emphasis on intervals. Some of the concepts are: reading ledger lines above, below and in between the grand staff; intervals of a 6th; enharmonics; and C, G, D, A, and F scales. Any 2nd-3rd year student will benefit from the note reading and intervallic drills covered in this attractive 40-page supplemental book.